The lights go down, music fills the room, and the show begins. A model steps out onto the runway wearing an original piece by an Indigenous designer. But this isn’t just the Indigenous category in some runway show. This is THE show. Every designer featured is Indigenous, and every model walking the runway is unique. 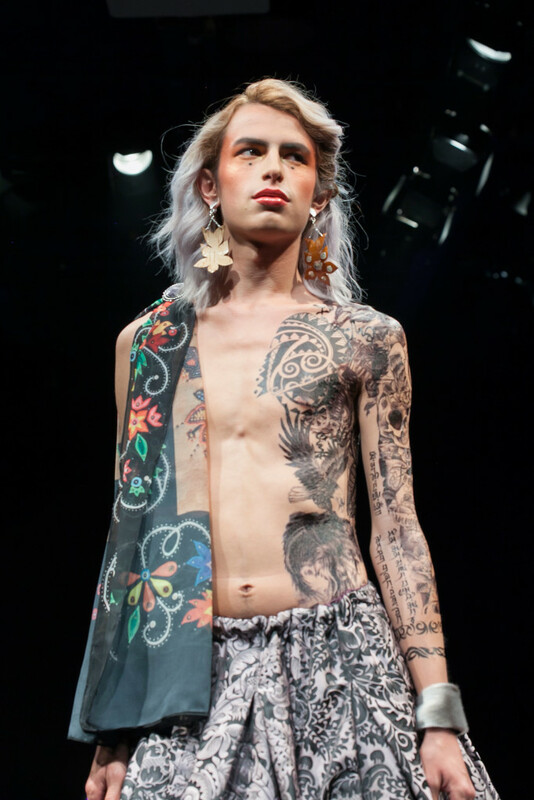 Inclusivity was a recurring theme at IFWTO, and the runway was no exception. Gender saw no bounds under the lights of the Harbourfront Centre. “From what I’ve been told modelling is normally like, I would say this is pretty unique. It dodged a lot of the toxicity I’ve been told is in the modelling industry,” says Cleo Keahna, who is White Earth Ojibwe and Meskwaki. “The experience has been amazing and fulfilling, and really community driven.” Keahna, who identifies as gay and trans, sported both suits and skirts on the runway. White Wind persevered in spite of the barriers put up by the fashion industry, which have started to come down in the last few years. “Don’t ever let anyone tell you that you can’t do something, just go out and do it,” she says.